At Build stage, you attach VPCs to an AWS Transit Gateway (TGW) and security domain. Each VPC can only be attached to one security domain. 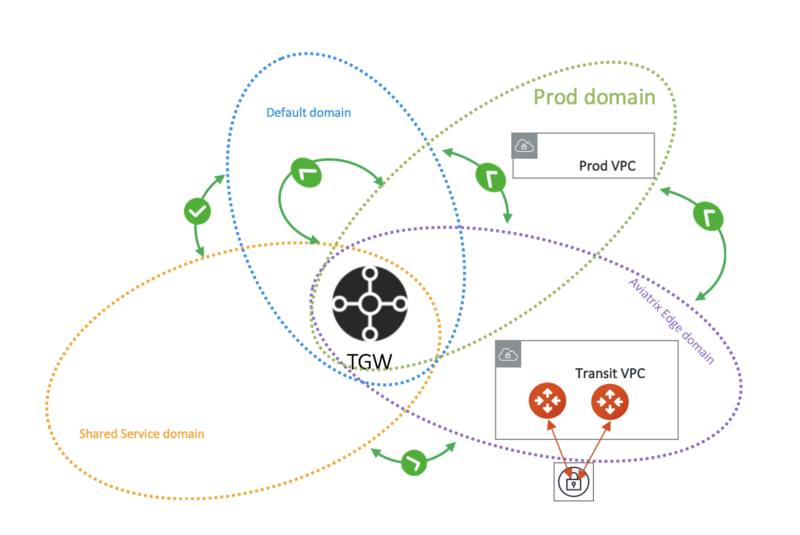 AWS Transit Gateway (TGW) Orchestrator Build workflow is a one step instruction to attach VPC to AWS Transit Gateway and security domain. For background information, refer to TGW Orchestrator FAQ. Before you can attach VPCs, you must have at least completed Step 1 in Plan page. Region Select a region where AWS Transit Gateway resides. VPC Account An Aviatrix account that corresponds to an IAM role or account in AWS. VPC Name Select a VPC in the VPC Account. TGW Account Select an access account where AWS Transit Gateway resides. TGW Name The name of the AWS Transit Gateway in the AWS Transit Gateway Account. Security Domain Name Select from a drop down menu domain. For example, you can attach a VPC to prod_domain created at the Plan page, as shown below. This step detaches a VPC from a AWS Transit Gateway and Domain.